WOO! I had derby practice last night, and I got to do my 1st contact work! We were practicing pack work like pushing each other to block a jammer coming up on the outside edge of the track, as well as steering them off the track with leverage. (Sorry, I’m still not sure of the actual names of these maneuvers!) SO MUCH FUN! And I’m so glad too, because I’ll be expected to participate in the next scrimmage on November 3rd, and I need some skills! I had to sit out the one this month, even though I had just joined the team, because I had only attended two practices: one was a fit skate, and one was on jam skating (basically dance skating), but they’re considered mandatory unless you’re sick, injured or out of town. Hope we get a lot more of these type of practices in the next two weeks! Thomas rode his bike up to the Rat’s Nest (where we practice) after work and met me, so we were both pretty hungry and decided to hit Wayward Vegan Cafe on the way home. He got his usual, the Wizard, and I got a nice healthy Bikini Bowl, which I’d had once before and was totally craving. 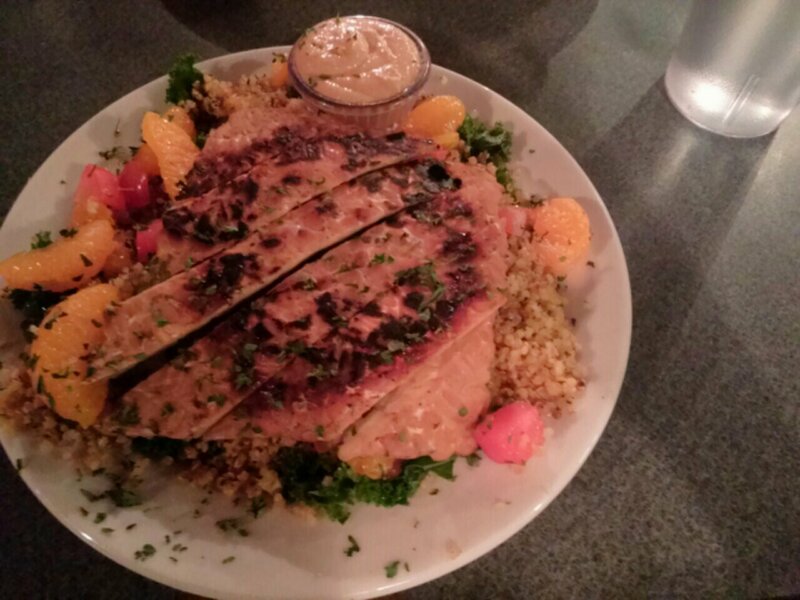 It’s on their gluten-free menu and is comprised of quinoa, steamed kale, mandarin oranges, diced tomatoes, citrus marinated grilled tempeh, and served with a side of chipotle tahini. So good. Totally hit the spot. I’m trying to do clean, protein packed meals after workouts lately so I can reap the benefits of all this exercise more fully. A little more challenging since I have less time to cook with all the skating, but I thought this was an excellent restaurant meal. Hopefully once we’re settled into the new apartment, I can start doing some smarter meal planning to compensate. Speaking of the new apartment… we’re officially moving Tuesday. So if I’m a little quiet for the next few days, that’s why. We haven’t packed a thing, but since we have 2 weeks to move, our attitude may be a little too casual. Tuesday we’re taking the big stuff over with a moving truck. Hopefully this weekend we can get most of the kitchen/bathroom/etc. stuff over there in little trips without having to make too big a deal about it. I hate moving. Not that you would know by how much I do it, but I’m hoping that we’ll be able to stay in the new place for a couple years or so, until we can get into a house.